Same as all the others in the Throne Room of Jesus. This time I was seeing other people viewing what I was looking at in heaven! I saw them look at that gigantic screen, which was several stories high. I didn’t see any faces as I was too far away. It seems I was looking down at the scene from a higher up point of view. Then I looked ahead at the screen and saw U.S. President Donald Trump walking down the steps of a parked jet. He then walked across a tarmac where he met Prime Minister Benjamin Netanyahu and shook his hand. I didn’t hear any talking but I understood this meeting had something to do in relation to a treaty. The following is part 2 of Sharlene’s vision 8, which she saw during her evening prayer on January 13 this year. Same routine. I saw President Trump standing behind and beside a seated Prime Minister Netanyahu at a very lovely and large (meant for a king-type) table who was signing what appeared to be an important document. There were flashes going off and I could hear them talking as journalists were continuously taking pictures. Then a certain dignitary walked in from my right and proceeded to shake President Trump’s hand. He was Arabic in appearance, wearing a white robe and a checkered type head covering. He had a short dark beard. It was a side profile and I didn’t recognize him. Interestingly, I saw Trump’s son-in-law standing in the corner (my right or their left) from the table. Beside him, stood a man shrouded in darkness; a man of mystery. I knew he was wearing a suit, but I couldn’t identify him. I actually asked Jesus about this man and He said: “It’s not the time to know that yet”. I was wondering if the man was the antichrist but I didn’t receive a confirmation of yes or no. It appears that President Trump will be signing a treaty with Israeli Prime Minister Netanyahu, so this is a new piece of information! 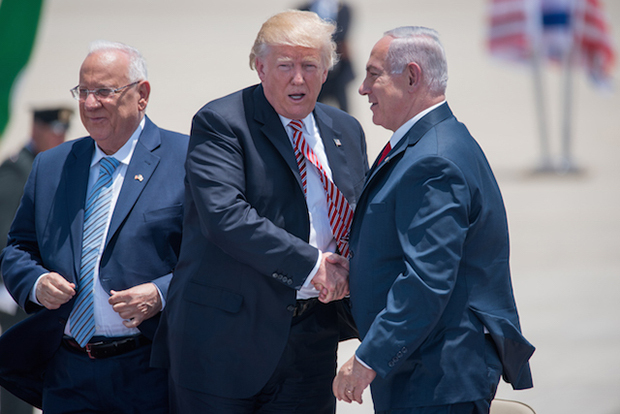 Trump has said that he wants to be the President that negotiates Palestinian/Israeli peace agreement…and I believe that it will happen during his presidency. This would fulfill the Daniel Covenant and start the 7 year tribulation/great tribulation period. We are so close to the prophetic time clock to begin ticking. I think that would be nice in a way…..but I think our time is too short for him to work out such a long standing log jam before America is crippled. I already feel that time is quickening…I think things will happen very quickly once prophesies start being fulfilled…starting with attack on Israel. He promised to defund Planned Parenthood, instead he just gave them half a billion dollars! The bill excluded an amendment to repeal DC’s assisted suicide law. And the bill also doesn’t provide funds for the border wall, although it does allow the government to spend money securing other countries’ borders. LKS- please check out Jerome Corsi and his explanation of the bill. It’s very interesting. The Omnibus Bill is different than a budget. President Trump can do what he wants with the money. He can withold it all or give it to them or part of it. He also explains that the money given to the engineers could be used for building the wall .He explains this is what Obama did for 8 years. I am not justifying it-just giving you a different perspective that you may not have been aware of. So saying and doing can be different that to me is lying. Well we may not know the truth I am thankful God knows. I believe and sense that you are right Miss Lydia, I didn’t like it when he called all those preachers up to him in his candidacy and they all laid hands on him and tried to bless his campaign. I mean, I applaud the intent, for some much was at stake….but it should have been a huge interview session and interaction and explaining to him the real gospel message,……one that I don’t think he’s still heard yet. Having Paul White as his spiritual advisor is in my view essentially worthless. But those in the Body of Christ who can discern the lateness of the hour for America and for the potential spiritual and physical safety of Trump, need to continue to lift him up for both Salvation and for Deliverance and Guidance. Abortion is an issue that is very near and dear to my heart. It is apart of my personal testimony. I was faced with the “choice” at the age of 17. I thought for many valid reasons that abortion was my solution. The night before I was going to have the abortion I had a dream 🙂 it was from the Lord. In the dream I gave all my reasons (all fear based) and He gave me other solutions. In the morning I could not remember the details but my heart was changed. I still went to my appointment, but I prayed there would be protesters at the clinic. If there were protesters I was going to take it as a sign and leave. There were no protesters that day. However in my pre surgery consultation my hesitation was apparent and the counselor advised I had more time to think because of how far along I was…. I left knowing I would never return! Today I have a 20 year old son. My one and only. He is on fire for God and dedicated to serving!!! I have served with local Crisis Pregnancy centers in counseling other women. I know I’m preaching to the choir here but this issue is a huge stain/abomination/sickness on our society! And I feel the mass shootings are part of symptoms of this disease. My heart aches for the babies as well as the parents who are deceived. We wrestle not against flesh and blood. Our battle ground in on our knees. I say this to remind myself… PRAYER is not passive! All have sinned and fallen short Steven . Certainly a lot in my life I am not proud about. Thanks for your courage to share and warn others. What a beautiful story, Rachel! Thank you for sharing something so personal to you. Donald Trump was offering his services as a peace negotiator between Israelis and the Palestinians in the early 80’s. Even if Trump gets some peace agreement signed, what makes this different than any other peace agreement that has been signed by past Presidents? My understanding of scripture indicates that the Anti-Christ “confirms” an agreement. That means he confirms an agreement already in place. I’m not saying he couldn’t be on scene today, but it’s the confirmation I am watching for. I’ve often wondered if it would be Trump that signs the initial agreement ( I don’t believe he is the antichrist but I do think he has a significant role to play in end time events) and then perhaps war and then the antichrist who is already on the scene confirms the covenant. Some believe the confirmation of the covenant is a confirming of the original covenant given to Abraham by God giving him the land. It is going to be interesting to see how this plays out. I agree 100%. President Trump could be involved with an initial agreement but the man who will later confirm that covenant for a period of 7 years is the Antichrist. About a month ago, I had a vision of a mountain. Then it split into several smaller mountains. I asked the Lord, when does this happen? He showed me the profile of a man sitting at a desk looking over a document, then signing it. At the angle I was seeing, I could not be sure, but the man seemed to be Trump. It matters much less who forms an agreement as who later makes the covenant firm for a period of 7 years. Trump, Kushner, and others could make up an agreement. But the one who will make that covenant firm for 7 years is the Antichrist. But this vision could be showing us how late it is if our current President helps form the initial agreement.